Detox update and resolutions: I’ve made it halfway!! I’m currently on day 23 of 40 and I have to admit that my old habits are starting to breakdown. Things are getting easier. There is light… in the middle of the tunnel?? OK, maybe that metaphor just doesn’t work here. But seriously, I feel great! I no longer miss that cup of coffee in the morning or afternoon. I’m actually awake! I’m almost annoyed at how chipper I am. My energy levels aren’t all over the place like they used to be. No more foggy mornings and post-lunch crashes. And now that I have brought sugar-free desserts back into my life, I feel less deprived. So with all the success I’m finding, I’ve been asking myself: How does life continue after this experiment ends? Will I continue with some of these new "habits" or will I go back to my old ways? What small changes are reasonable or necessary? • Caffeine/Coffee: To be fair, I never really drank coffee regularly until my last two years of college. It’s only in the last three years when I started working at a company with a free coffee machine that gave me the option of cappuccinos and latte macchiato that I really became a two-cups-a-day sorta gal. Now that I have step away from this, I realize what a vicious cycle it can become. I needed the coffee, because I was drinking the coffee. I was drinking the coffee, because I needed the coffee. But I have also just grown to love the taste and smell, especially when eating baked goods. It’s therapeutic and romantic to hold that warm cup in your hands while the aroma swirls around you. I don’t want to give that up. My other reservation is that sometimes that caffeine boost is just what I want. Resolution: I’m going to try to drink only decaf during the week and save regular coffee for weekends and special occasions involving baked goods. • Processed carbs: Surprisingly, this has been the easiest change for me emotionally. I don’t really miss pasta and bread all that much. Weird, I know. But with all the alternative sources of carbs (beans, lentils, quinoa, etc. ), my body doesn’t seem to crave them. The cauliflower-based alternatives (rice, pizza crust, mashed potatoes) are really going a long way in helping me stay satisfied. The only real problem is that you have to think about where your calories are going to come from. Resolution: I want my diet to rely less on processed carbs, but I don’t intend to cut them out entirely. By that I mean I don’t want my standard breakfast to always be toast or to have dinner include pasta more than three nights a week. I have no qualms about eating processed carbs when I eat out, because I only really do that a few times a week. And I will go back to baking with flour, but hope to start bringing gluten-free recipes into my baking repertoire. • Sugar/Sweets: This is a tough one. I’m still thinking about how to approach it, because sugar is in things that are dear to me and I just refuse to live without – namely baked goods and chocolate. Being Swiss pretty much means chocolate runs through my veins. It’s my life source. It contributes to my quality of life and joy. It’s not something I want to give up entirely. But since cutting sugar out, I’ve become acutely aware of how much I was consuming – often without evening knowing it. And I’m fairly certain most people would consider my consumption to be average, which is a little scary. The thing is sugar is added to so many foods that you just forget about – yogurt, canned tomatoes, sandwich meats, crackers and breads. And this is something I CAN do without. Resolution: I will absolutely start paying more attention when grocery shopping and try to purchase products that do not have added sugar. For instance, I intend to keep buying plain yogurt and stop eating ones that are flavored and make sure my tomato sauce isn’t spiked with sugar. I intend to use as many whole foods in my cooking as possible to help cut out all the other crap that comes along with processed foods. Since I am not willing to give up my baked goods and chocolate, I think I will settle for just making wise choices as to when it’s worth it to eat and when it’s not. Homemade cakes, cookies, pies = Totally worth it. Run-of-the-mill doughnuts and pastries that have been sitting in the office kitchen for four hours drying out already = Probably not worth it. All this said, I’m still not sure what to do about chocolate. • Alcohol: Another tricky one, because it is so closely connected with social activities, celebrations and relaxation. You picture yourself sipping red wine at a delightful dinner party, clinking champagne glasses at a wedding, drinking a refreshing beer on a hot summer’s day while you grill or stirring a mojito by the pool. It’s easy to forget that you are hurting your poor liver and wasting the day after a big celebration feeling rough. Intentionally not drinking really makes you aware of this. But your liver can handle a certain amount of alcohol. The key is just not to over do it – in quantity and frequency. Processing alcohol results in a highly toxic metabolite which can contribute to liver cell damage, but provided you give your liver time to recover it regenerates. And to consider what other factors your body is or will be dealing with at the same time. Are you feeling rundown already? Did you have a lot of caffeine, which also taxes your liver. Resolution: Clearly, I'm not cutting it out. All things in moderation, even moderation. I see nothing wrong with enjoying a glass of wine while cooking or having that beer while grilling. My main takeaway is to be more intentional and aware of my alcohol consumption. As part of this, I intend to start considering the sugar content of the beverages I'm drinking and try to scale that back as well. Enough rambling about what I want to do when the 40 days are over, though. I have to get through them first! I'm on a roll with Mexican now. First the fajitas, now stuffed red peppers. I'm in heaven. Also, I’m thinking my next Mexican-inspired dish will included mango and a yogurt chicken marinade thanks to my coworker who shared her delicious lunch of grilled chicken and mango with me. This time I was looking for another protein-boost. After finishing a crossfit workout, I wanted to make sure my sore muscles would had everything they needed. Spiced ground turkey loaded into succulent red peppers was the ticket!! I will be a lean, mean crossfitting machine if I keep eating like this. Side note: I can't wait to make an Italian version of this. Vegetarian version: Use 1 1/2 cups cooked rice instead of ground turkey. 1. Preheat oven to 350F (175C). In a large pan on medium heat, brown the meat. 2. When it is brown, add onions and sautee until translucent. 3. Then add garlic, jalapeños, spices, corn, black beans and tomato sauce and simmer on low, covered for 15 minutes. 4. 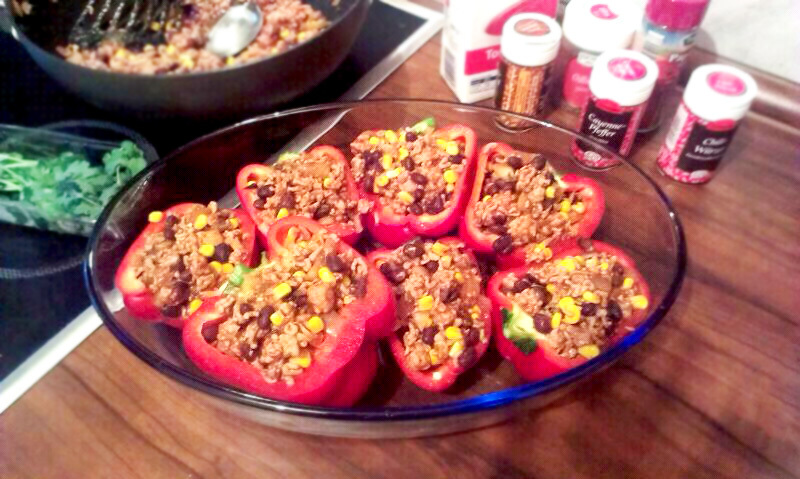 Fill the peppers and place in a large casserole dish, pour broth into pan and cover the casserole dish with foil. 5. Bake for 45 minutes or until the peppers become soft. 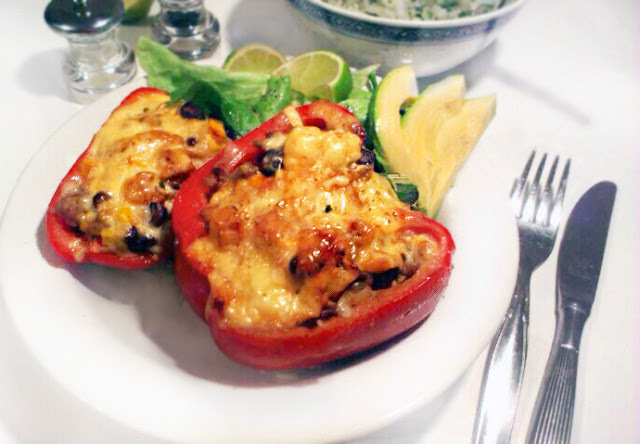 Remove the peppers and cover them with cheese. 6. Bake uncovered for an additional 5 minutes or until cheese is melted and golden brown. 7. Garnish with chopped cilantro and parsley. Serve with sour cream, lime and avocado alongside a small salad.